2016 was the busiest Atlantic hurricane season in the past four years and served as a reminder of how devastating hurricane damage can be. Last year, there were 15 named storms in the Atlantic basin, and 2 hurricanes made landfall in the United States, which was above the annual average of 11.7 named storms and 1.7 landfalling hurricanes in the US (NOAA). The two hurricanes that made landfall in the US last year, Hermine and Matthew, caused over $7 billion in property damage and an estimated $3.5 billion in insured losses (III). The risk of hurricane damage is ever increasing, as the population of the US coastline continuously grows. According to CoreLogic’s 2017 Storm Surge Report, there are currently over 800,000 US residential properties at extreme risk (would be affected by a Category 1-5 hurricane) for storm surge damage. The report also estimates that there are over 20 million homes currently at risk for storm surge from a category 5 hurricane. Hurricanes bring many destructive forces that can cause extensive property damage. 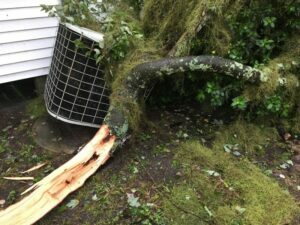 The majority of the claimed hurricane damage to HVAC systems is due to wind, water, and lightning/surge. 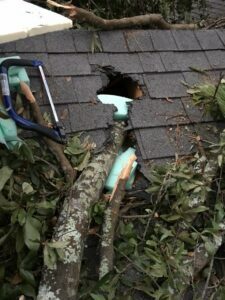 To help prepare you for any tropical storm or hurricane damage claims that come your way this season, we’ve put together a toolkit designed for adjusters, like you, with resources on the three main hurricane damage types. 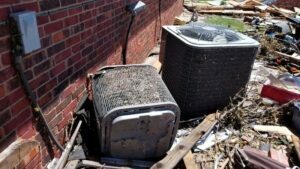 Windblown dust and debris can clog the condenser coil and restrict air flow. Larger windblown debris can dent the malleable aluminum fins of the condenser coil. 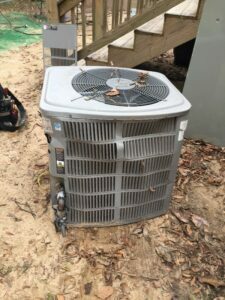 Large objects can crush the condensing unit. High winds can blow the unit askew or knock it completely over. Hurricanes begin as a cluster of thunderstorms over the ocean, and with the help of wind convergence, these storms form into a hurricane (NASA). The most destructive part of a hurricane is the eye wall, which is comprised of a ring of tall thunderstorms. These thunderstorms can lead to widespread lightning damage as the hurricane makes landfall. Additionally, the high winds of a hurricane can knock down power lines, which can result in surge damage to homes and businesses. The electrical components of an HVAC system are particularly susceptible to damages from surge and lightning. In fact, 32% of systems that we assessed following Hurricane Matthew were damaged by a surge or lightning event. NASA anticipates that both the frequency and intensity of hurricanes will increase as the earth’s oceans temperatures warm. While current NOAA predictions for the 2017 Atlantic hurricane season are less severe than what occurred during the last year, they are nevertheless forecasting an above average year with 11-12 named storms, 5-9 hurricanes, and 2-4 major hurricanes. These forecasts remind us that it is important to arm ourselves with the necessary tools and education to be prepared for these ever-present catastrophic losses.